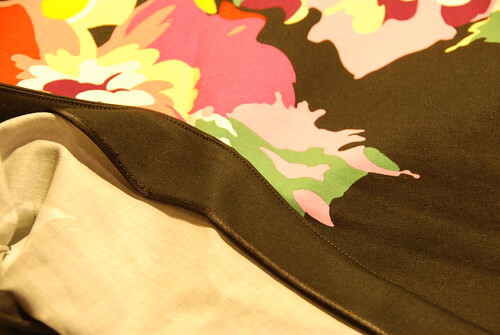 Deep Purple Drape and Floral Skirt, originally uploaded by fmirela. The same pattern all over again… for the drape neckline top. I’ve also sewn this pattern recently in a jersey wool, green and the gray one awaits hems. I simplified the skirt pattern by removing the waist bands. Nice pattern for a simple pencil skirt. I added lace under the hem line and hand stitched the hem. I also added a ribbon (folded over the raw edge) for the front and back facings. I used an invisible zipper on the side. I turned the overlocked edges of the side seams towards the inside and sewn over. A basic top pattern can be altered to create a drape neckline. To obtain the drape effect on the front neckline, I’ll draw some lines on the Lydia Top from BurdaStyle to make it similar to the pattern I used. I haven’t tested this, but I’m trying to give you an idea of how the pattern actually is. Discard the neckline facings. These will be cut in one piece with the front and back. Raise the inner corner of the shoulder seam in the back just a little, and also the center back line. 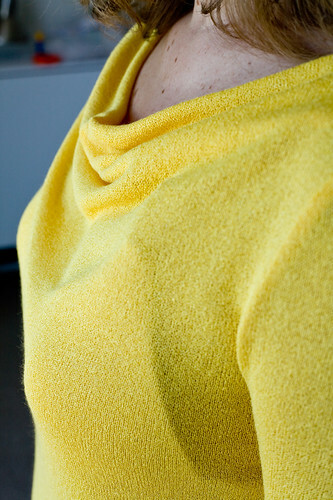 Create a V shaped line at the outer corner of the shoulder seam, to create the back facing, that will fold in when sewn. Cut in a small pinch at the tip of the V line, to stitch the shoulder seam and the facing line when sewing the front piece to the back piece. 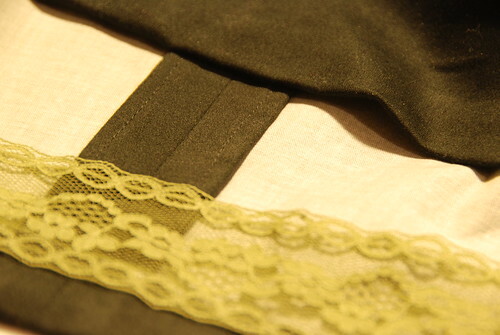 The facing will be folded inwards, thus visible finishing seams will not show on the right side of the fabric. For the front side, elongate sideways the pattern at the shoulders, draw the same V line and create the facing by raising the neckline. I hope this is useful, and you get an idea of how the drape in the front can be created. The drawing is similar to the pattern I have used, and I think that Lydia can be adjusted this way. 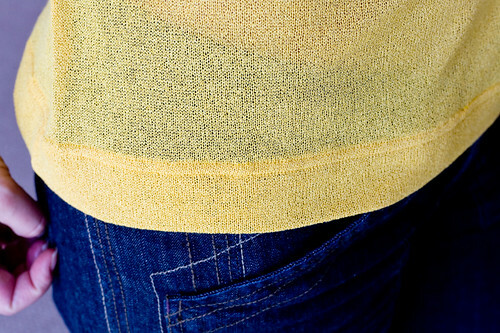 Yellow Drape Top, originally uploaded by fmirela. My favorite pattern for drapy fabrics again and again. Not much to say really, a simple fast serger project. Not a stitch done on the sewing machine, everything in this one is serger, so speed. Simple cut, drapy fabric, 15 minutes cutting out and about an hour of sewing. 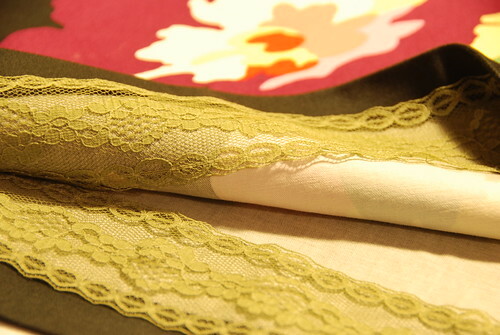 Here are some details so you can see the fabric. My mom got this for me in that little dusty Italian fabric shop back home in Cluj, Romania. A quick sew from the latest Burda top sewing.